Here’s a look around the newest breakfast spot and bakery to open in Winchester. It’s a cafe version of the Hoxton Bakehouse, a bakery in Southampton. It’s so popular that people queue up on a Saturday morning to bag themselves the tastiest loaves in town! 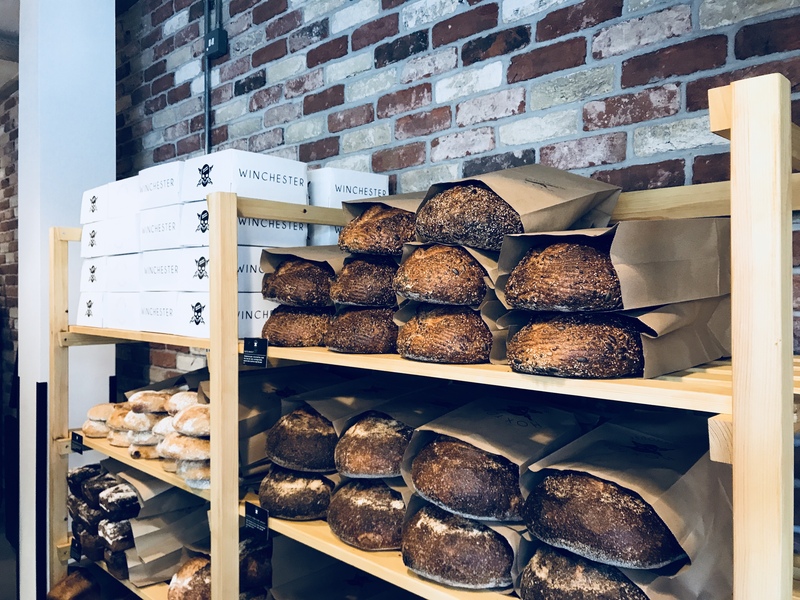 Hoxton Bakehouse supply bread to top foodie boutique hotel hang outs like The Pig, Lime House and The Southampton Harbour Hotel. 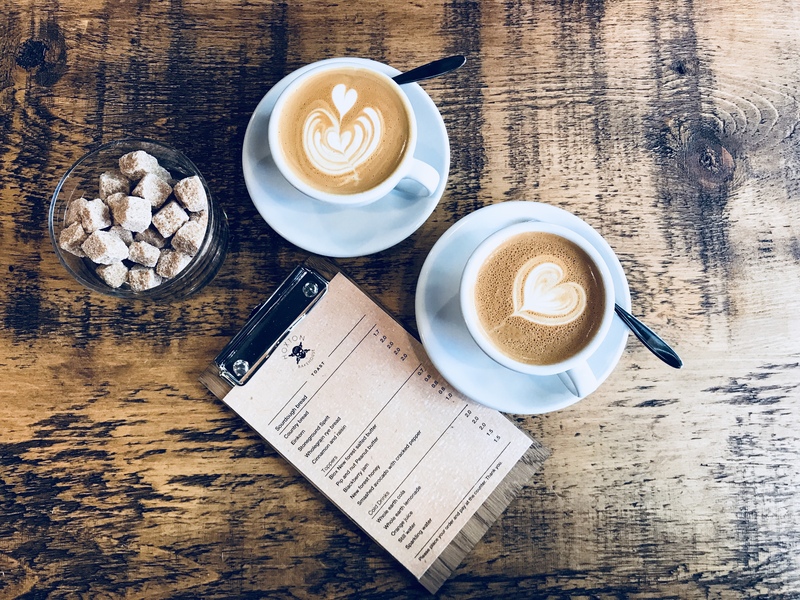 It also supplies to a range of cafes local to Southampton like, the Mettricks coffee house chain. 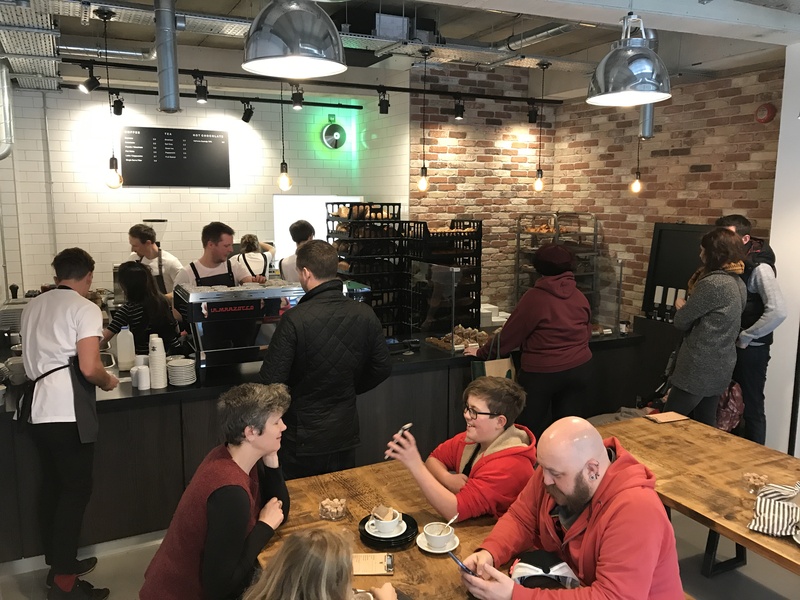 We got up early on launch day to get across to Winchester to support Hoxton Bakehouse’s latest venture. It really is in a prime spot opposite Loch Fynne, just up from the main high street. A menu of toast and coffee awaited us on Jewry Street, much to our delight. There was already a queue to the door with people up early buying loaves and getting coffee to take away. 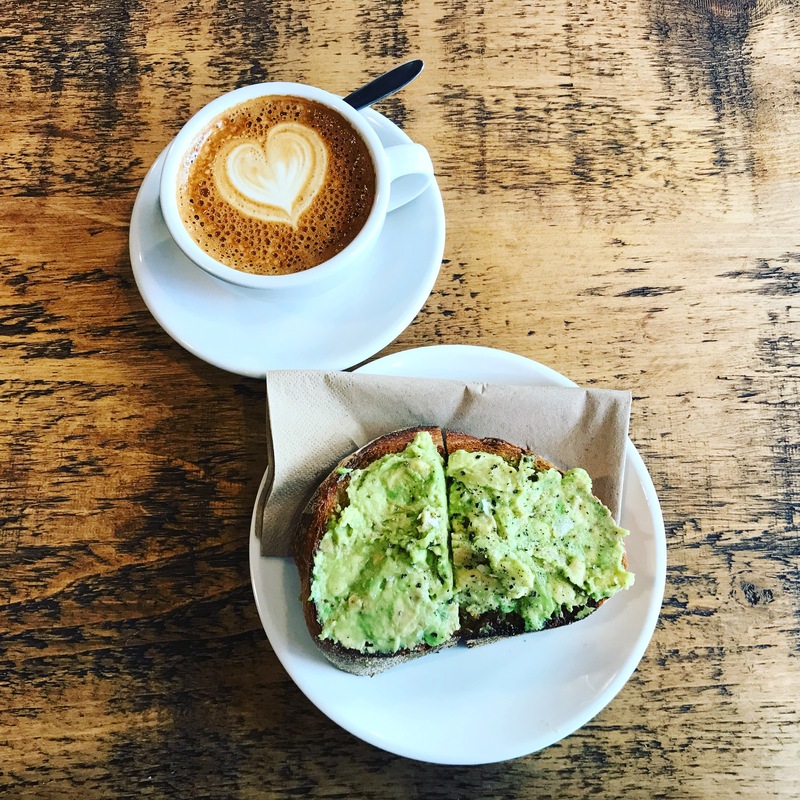 We ordered coffee and the avocado on toast – it was so delicious. And, in the words of Mary Poppins it was truly scrumptious! The avocado was seasoned perfectly and the coffee was strong. Simple stuff done really well and that always hits the spot in my books. It’s so Instagram worthy. Yes, of course, it’s already on my Instagram feed and Hoxton Bakehouse used my photo on its Instagram account! Inside think hipster, it’s interior is a mix of brick, exposed industrial piping and chunky wooden tables and benches. It’s also not huge, it probably seats around 15 people. But, that’s not really a problem, the menu is toast with different toppings of your choosing, so you’re not going to be there for a very long time. 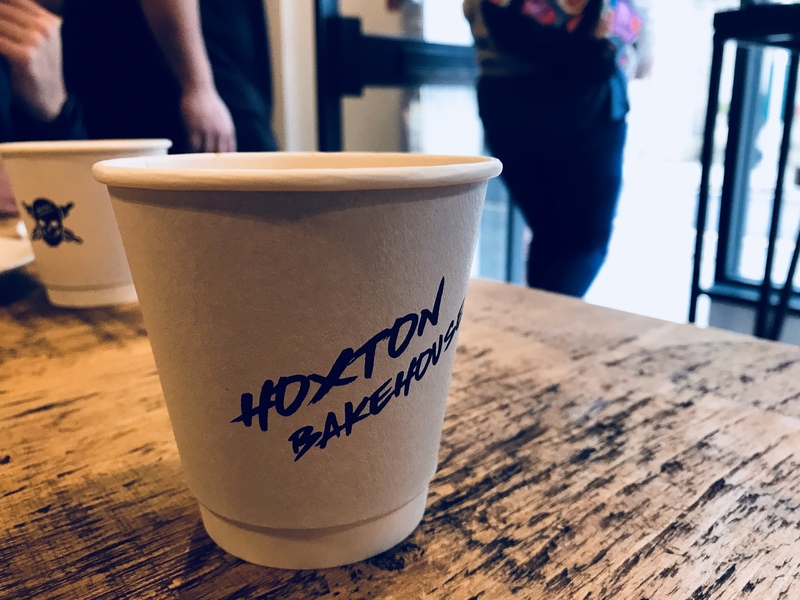 The Hoxton Bakehouse menu is toast with a range of toppings – simple but delicious! You’d normally see this sort of place in London, it’s so brilliant that we’re starting to see independent places open up in the south. I’m not going to lie, in the south of England, we’re dominated by chain restaurants. We’re crying out for independents to add some diversity to our high streets. That’s why I’m a little gutted it’s not a cafe in Southampton. We could do with an independent just like this but, I do understand why they’ve opened in Winchester. I’m just jealous, thankfully it’s only down the road and we haven’t got far to go! We have sampled most of the bread now and it really is top notch. We’re now slowly working our way through the pastries. 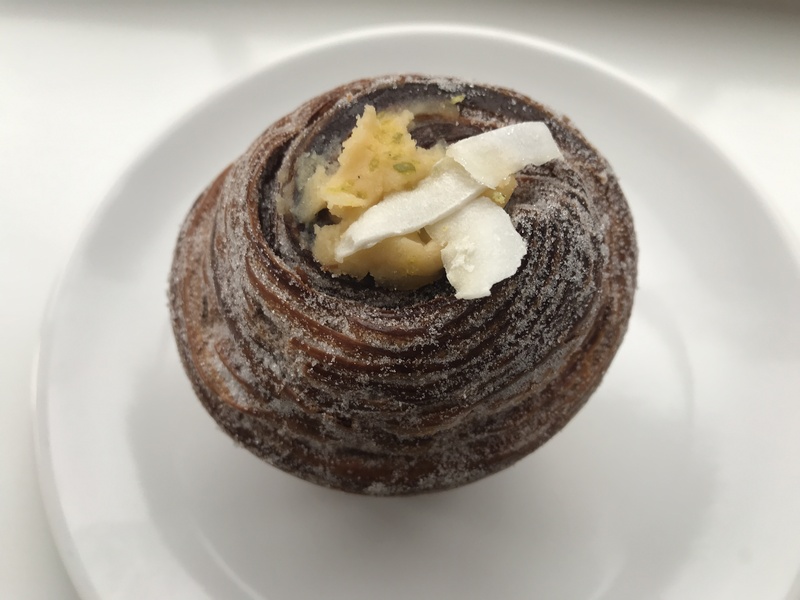 This time we picked up a lime, coconut and mango filled cruffin which, I think is a croissant-muffin hybrid. We took it home to have with a cup of tea in the afternoon. Now filled pastries aren’t usually my thing. 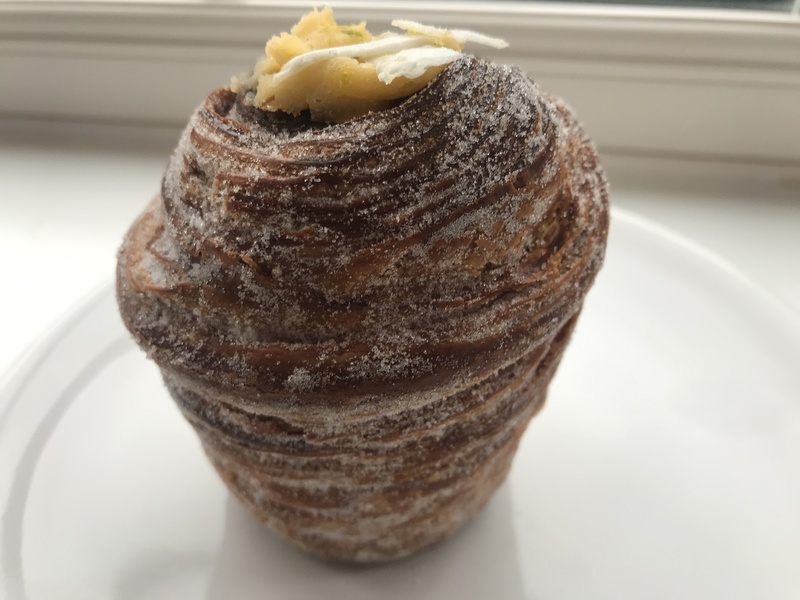 But, this cruffin totally changed my opinion on things like this. It was crispy on the outside and soft in the middle and the coconut, mango and lime filling was just the right amount. You only need a little because it’s lovely and fresh and zingy. 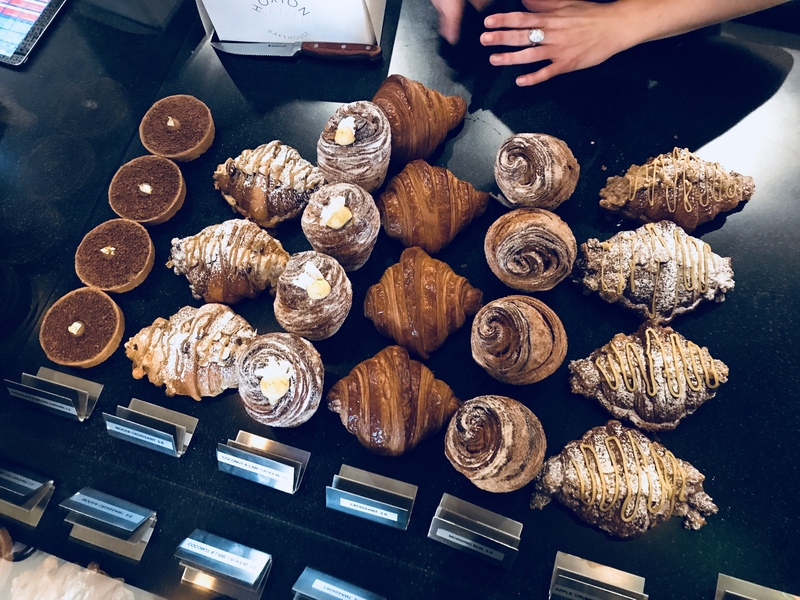 Lots of places tend to over fill their pastries and I think that’s why I can’t handle them – it’s just total sugar overload. But, sharing this with my chap with a cup of tea was perfect later that day, especially as I’d spent a ridiculously long time trying to get my eye checked out after I cut it! We met lots of people who had also come from Southampton to support the shop. We bumped into one family who were so sweet and were helping me with what to pick because they had tried every cake Hoxton Bakehouse make! What a cracking morning! What a silly face that is! 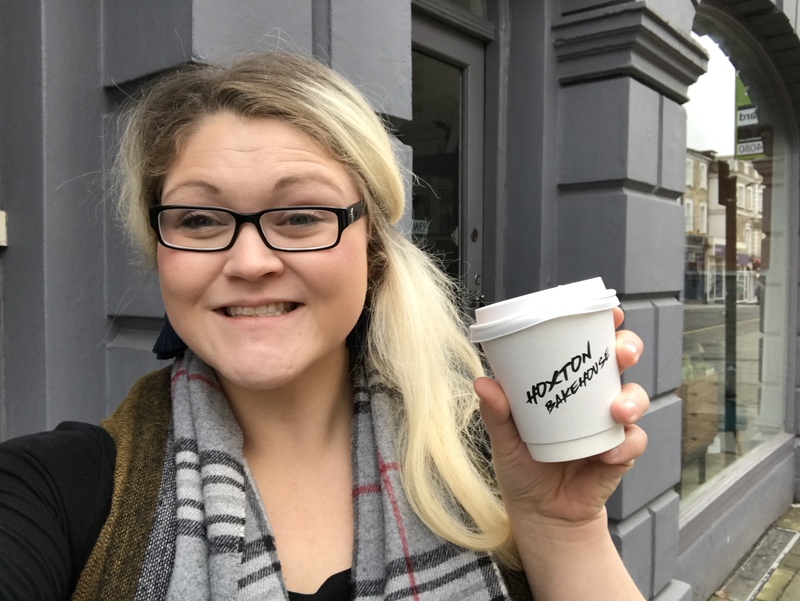 After our visit we picked up some take away coffees to take with us down the high street! I got a mocha and the chocolate used is a very fancy sort, which I forgot to note down (sorry!) but, I do remember it was 70% cocoa solids and the only one on the menu. It was rich, not too sweet and the perfect antidote to a cold, crisp winters morning. It was such a wonderful way to spend the morning. As you can tell I’m such a big fan of this place and really want to support local independents so they thrive! It’s so important, I am so fed up of going to different towns and cities across the UK only to see the same places. 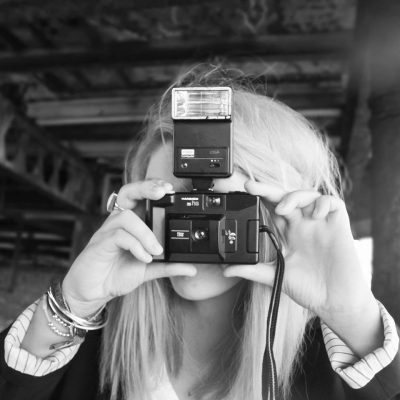 It’s our differences that make us great, interesting and fun. 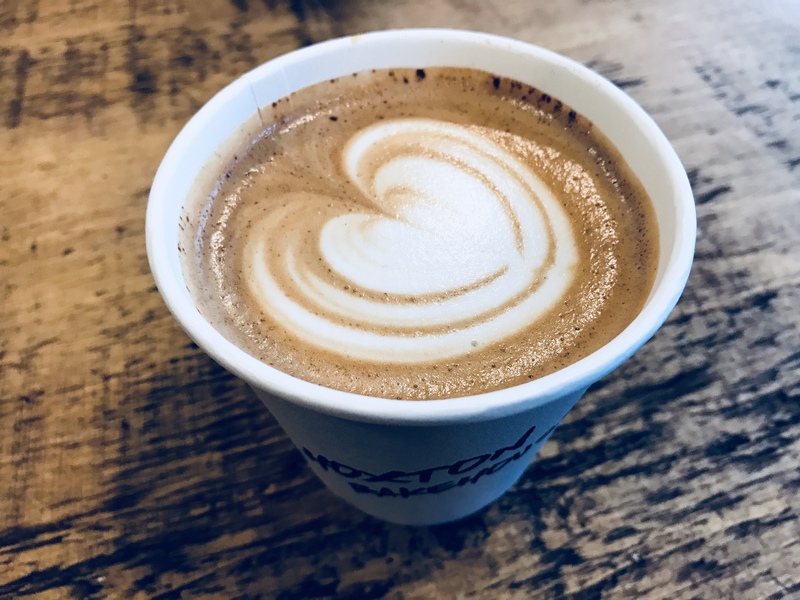 Have you been to the Hoxton Bakehouse yet? Let me know what you think! If you don’t live locally, where’s your nearest independent, what do they do and why do you love them?